Though the origins of wearing cloth tied around the neck lie embedded in antiquity (Chaille 2001), most scholars concur that it was the Thirty Years' War (1618-1648) that cemented the practice within European cultures. Fought between Sweden and France on one side and the Hapsburg Empire on the other, the conflict introduced French soldiers to the loose-tied neckerchiefs of Croatian soldiers, which some continued to wear once they had returned home. Nevertheless, disagreement shrouds the etymology of the word "cravat," a derivative of the French cravate, which denotes modern neckties, men's scarves, and neckbows. While some sources-including the Oxford English Dictionary-make a direct link between cravate and croate, others are more circumspect, looking instead to the Turkish kyrabàc, the Hungarian korbàcs, and the French cravache, all of which relate to long, slender or whiplike objects (Mosconi and Villarosa 1985). Linguistic roots aside, there is consensus that 1650 was the key point at which neckwear became a distinctive feature of western men's dress. It has been suggested that its popularity was further enhanced by a climatic factor known as the "Maunder minimum," which saw temperatures dip especially low between 1645 and 1705 (Chaille 1994). The Battle of Steinkirk in 1692 introduced the "Steinkirk" to fashionable Europeans. Consisting of a long scarflike cravat with ends of fringe or lace that were looped through the buttonhole of the jacket (Fink and Mao 1999), it was also popular with women who would sew buttonholes into their gowns to accommodate the loose ends, or simply tuck them into the laces of their corsets (Chaille 1994). The Steinkirk had a continuing presence in portraiture long after its real-life popularity had waned, for artists such as Joshua Reynolds and Thomas Gainsborough often painted their subjects wearing the attire of their predecessors (Gibbings 1990). By the early eighteenth century the soft flamboyance of the Steinkirk was replaced by yet another style with military origins. Popularized by French and German foot soldiers at the end of the seventeenth century, by 1700 the stock had been adopted by civilians (Colle 1974). Originally consisting of a piece of white muslin folded into a narrow band, wound once or twice around the neck and fastened at the neck with tapes, buttons, or a detachable buckle (Hart 1998), the stock developed into a simple high collar stiffened with horsehair, whale-bone, pig bristle, card, or even wood covered in cloth (Gibbings 1990). While it did impart a stiff, formal posture, it was ultimately an uncomfortable and unhealthy style because it restricted the throat (Gibbings 1990). However, stylistic formality evolved into a softer, more decorative style when black ribbons used to tie the hair back were brought to the front and tied in a bow known as a solitaire, creating a contrast with the white stock beneath it (Fink and Mao 1999). The next significant development came in the 1770s, championed by a group of young English aristocrats dubbed the Macoronis. Influenced by styles they had seen while travelling in Italy, they took to wearing white cravats with voluminous bows (Chaille 1994). In France, in the 1790s, young men known as the Incroyables (or Unbelievables) displayed their contempt for sartorial conventions by wearing clothing with exaggerated proportions, including huge cravats consisting of fabric wound around the neck up to ten times (Fink and Mao 1999). The extravagance of the late 1700s gave way to a quest for simple elegance in the early nineteenth century, exemplified by dandyism in general and George Bryan Brummell (1778-1840) in particular. The key to "Beau" Brummell's style lay in understatement. Though decidedly middle-class in origin, he attained an aristocratic air through an obsessive emphasis on the cut, detail, and refinement of his clothing. Immaculate, starched cravats were central to his self-presentation and he is said to have spent hours perfecting the art of knotting, pleating, folding, and arranging them (Gibbings 1990). 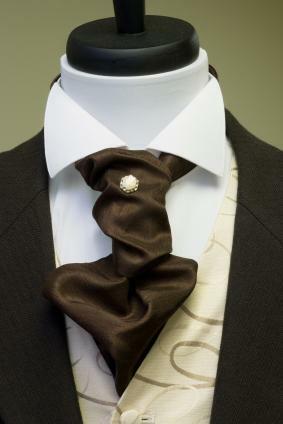 The popularity of cravats at this time gave rise to publications that detailed ways of tying them. Published in 1818, Neck-clothitania presented 12 styles, L'Art de se mettre sa cravate described 32, and L'Art de la toilette outlined 72 variations. Around the time of Brummell's death in 1840, cravats became politicized as proponents of white cravats-affiliated with traditionalism-took on those who favored black cravats, which were associated with liberal politics (Chaille 1994). Ultimately, it was the black stock and cravat, made popular by the English monarch George IV (who reigned from 1820 to 30) that triumphed, although red ones-briefly fashionable with French and German revolutionaries in 1848-never gained much of a following in English society (Chaille 1994). As the nineteenth century progressed, high-buttoned jackets became popular, making large, complicated cravats difficult to accommodate. Moreover, as increasing numbers of men joined the office-based workforce, few had the time to spend on the knotting and arranging of neckwear. While ready-made neckwear may have offered convenience, the higher echelons of English society remained disdainful of such practices (Hart 1998). Yet the growing diversification of the workforce, prompted by the industrial revolution, fostered a proliferation of neckwear styles by the late 1800s. Ultimately, the cravat of the nineteenth century gave rise to four main styles: the bow tie, scarves and neckerchiefs, the Ascot, and the four-in-hand or long tie (Hart 1998). Developments in photography since the mid-nineteenth century have allowed costume historians to examine neckwear from this period onward in detail, and nineteenth-century visiting cards-often showing just the head and shoulders-have proved an invaluable resource to researchers (Ettinger 1998). Evolving from some of the popular Regency styles, the bow-tie diminished in size so that by the end of the nineteenth century, two dominant shapes were recognizable: the butterfly and the bat's wing (Fink and Mao 1999), both of which have an ongoing presence in men's attire even today, but especially in the context of formal wear. Scarves and neckerchiefs, by contrast, tend to be associated with the working classes who originally wore them out of necessity. Popular with both men and women and typified by a square shape folded into a triangle, scarves may be knotted in dozens of ways to protect and decorate the throat (Mosconi and Villarosa 1985). Similar to the Gordian cravat of the early nineteenth century, the Ascot became popular in the 1880s when the upper middle classes of English society started to wear it to the Royal Ascot race and other outdoor events (Hart 1998). Initially made of plain silk, the Ascot had square-ended blades that were crossed over the shirtfront and held in place with a cravat pin. Many were sold readymade in very bright colors (Gibbings 1990). The long tie or vertical tie originated as young men's sporting attire in the 1850s, but became widespread within a decade (Fink and Mao 1999). More than one explanation is given for its alternative name, the four-in-hand. Some believe it to be a reference to the Four-in-Hand Club, a London gentlemen's club whose members tied their neckwear using the four-in-hand knot (Fink and Mao 1999), while others suggest that its knot and trailing ends resembled the reins of four-horse carriages driven by members of the English aristocracy (Chaille 1994). Early versions of this style of tie were simple rectangular strips of material with identical square ends that reached no lower than the sternum as waistcoats were usually worn (Chaille 1994). Practical because it neither impeded movement nor came undone, it was adopted both by workers and by the leisure classes as high, stiff collars gave way to soft, turned-down ones. As the Victorian middle class grew and male attire became increasingly homogenous (dark, somber coat and jacket and trousers in a limited range of cuts), ties became a signpost of social status (Gibbings 1990). Evolution of the club, school, and regimental ties meant that those in the know were able to identify a man's social ranking based primarily on the color and pattern of the tie they wore. Even in the twenty-first century, some sectors of British society still believe that the stripes on one's tie define an individual to himself and to others (Sells 1998), and the expression "old school tie" persists, reflecting membership of a specific, privileged class. Although women had worn cravats and scarves in various forms alongside their male contemporaries primarily out of coquetry (Chaille 1994), it was in the late nineteenth and early twentieth century that neckwear took on a politicized significance. The evolution of Rational Dress encouraged women to adopt attire that not only allowed greater freedom of movement but also was essentially more masculine in appearance (Gibbings 1990). As the women's suffrage movement gained momentum, the tie-when worn by women-became a symbol of independence and feminist convictions (Chaille 1994). Already established as the most popular form of men's neckwear in the early part of the twentieth century, the four-in-hand's success was cemented commercially by an American named Jesse Langsdorf. He improved the drape, elasticity, and wear of ties by cutting them diagonally (at 45 degrees) on the bias instead of cutting the fabric conventionally in an up-and-down direction. The process of constructing a tie from three separate pieces of material, known as Resilient Construction, was patented by Langsdorf's company, Resilio, in 1924 (Ettinger 1998). Though knitted ties, or Derbys, attained a degree of popularity in the early part of the twentieth century, Resilient Construction essentially brought the evolution of the modern necktie to a halt (Chaille 1994). Since then tie widths have fluctuated from two to five inches, although the usual width continues to be three to three-and-a-half inches (Fink and Mao 1999). With shape and dimension more or less fixed since the 1920s, mass-production methods ensured that ties were readily available to men from all socioeconomic groups. With the onset of the Great Depression in the United States during the late 1920s and early 1930s, business slowed down; however, the widespread popularity of cinema contributed to a boom in tie sales as Americans sought to emulate their film idols (Ettinger 1998). Images of actresses such as Marlene Dietrich and Katharine Hepburn wearing ties remain some of the most iconic and memorable in cinematic history, demonstrating the potent impact of a woman wearing what had become a quintessentially male item (König 2001). In the United Kingdom, meanwhile, society figures such as the Duke of Windsor were influential, and the Windsor Knot became a popular method of tie-knotting (Chaille 1994). As the twentieth century unfolded, variety in neckwear continued primarily through the changing use of fabric and color. Developments in textile technology, particularly throughout the 1930s and 1940s, meant that traditional fibers such as silk, wool, and cotton gave way to synthetic yarns including rayon, nylon, and polyester as they were cheaper and therefore well-suited for mass production (Goldberg 1997). Yet tie aficionados would argue that woven silk, possibly blended with wool, continues to be the most suitable fabric for a tie because of the "hand" that it gives (Chaille 2001). Though wartime rationing in Europe during and after World War II (1939-1945) put a hold on nonessential manufacturing, in the United States, the tie market flourished with stripes, plaids, and other patterns making an appearance (Ettinger 1998). In the postwar years, however, men on both sides of the Atlantic sought flamboyance, leading to a proliferation of brightly colored ties known as the Bold Look (Goldberg 1997). Popular designs in the 1950s included those with an Art Deco influence, flower and leaf prints, wildlife themes, and "Wild West" designs (Ettinger 1998). In the latter half of the twentieth century, ties ceased to be an essential component of everyday menswear, and were no longer seen as the definitive signifier of respectability. 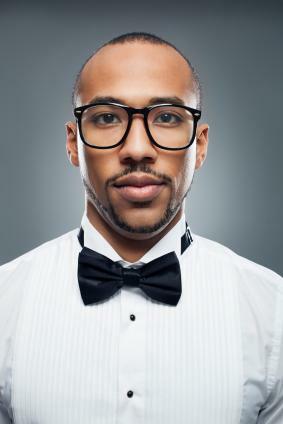 As youth culture liberated young men from the sartorial conventions of their parents, the tie became an occasional item to be worn at school (by girls as well as boys), work, and formal events (Chaille 2001). Having said this, distinctive styles, such as skinny "mod" ties and wide "kipper" ties of the 1960s, have earned their place in fashion history, complementing the stylistic characteristics of the suits they accompanied (Goldberg 1997). Despite a global drift toward casual dress, it seems likely that neckwear, and specifically the tie, will continue to have a presence in men's dress. See also Dandyism; Europe and America: History of Dress (400-1900 C.E. ); Military Style; Sports Jacket. Chaille, François. The Book of Ties. Paris: Flammarion, 1994. --. The Little Book of Ties. Paris: Flammarion, 2001. Colle, Doriece. Collars, Stocks, Cravats: A History and Costume Dating Guide to Civilian Men's Neckpieces, 1655-1900. London: White Lion Publishers Ltd., 1974. Ettinger, Roseann. 20th Century Neckties: Pre-1955. Atglen: Schiffer Publishing Ltd., 1998. Fink, Thomas, and Yong Mao. The 85 Ways to Tie a Tie: The Science and Aesthetics of Tie Knots. London: Fourth Estate, 1999. Gibbings, Sarah. The Tie: Trends and Traditions. London: Studio Editions, 1990. Goldberg, Michael Jay. The Ties That Bind: Neckties, 1945-1975. Atglen: Schiffer Publishing Ltd., 1997. Hart, Avril. Ties. London: V&A Publications, 1998. König, Anna. "Tie Me Up, Tie Me Down." The Guardian 31 (August 2001). Mosconi, Davide, and Riccardo Villarosa. The Book of Ties. London: Tie Rack Ltd., 1985. Sells, Christopher. Ties of Distinction. Atglen: Schiffer Publishing Ltd., 1998.